Whether you need prescription glasses or just want to look great in a new pair of non-prescription sunglasses, you will find almost 1000 different styles of designer eyeware and designer glasses at the office of Dr. Barry Leonard. You can find glasses with full rims, semi-rimless or even totally rimless. In addition to the more common plastic frames, we also carry special hypoallergenic frames for our more sensitive patients, as well as eco-friendly frames, if you are trying to be more green. One of our more popular types of frames are those made especially for people who lead a more active lifestyle. These designer frames are usually made out of titanium, which is an ultralight, ultra-flexible metal that, when bent, easily returns to its regular shape. What many people don’t realize is that there are different shapes of glasses and lenses to complement almost any facial shape or style. That is why fashion eyewear designers are so popular: they make a variety of designer glasses to fit any face, and they make your face a face that people want to see. 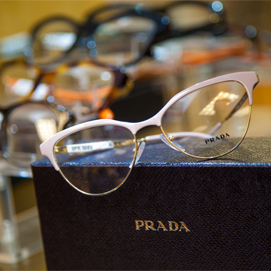 PRADA is just another of the many designer eyewear brands Dr. Leonard carries in his SFV showroom. Prescription eyewear should be fashionable. 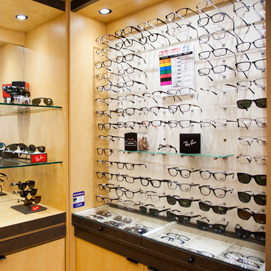 Dr. Leonard carries a variety of Ray-Ban designer glasses for his SFV patients that want to both see and look great. Whether you have a round shaped face, oval-shaped face, thin face, square face, big nose (that you want to make look smaller), a small nose (that you have trouble resting glasses on), big ears (that you’d like to not over-emphasize), or small ears — even a Jay Leno sized chin — we’ve got a pair of designer eye glasses to make you look great. And of course, don’t forget that the real reason you are wearing glasses in the first place is to make you see better. And so no matter what kind of glasses you get our expert staff will spend as much time as necessary with you to properly fit and adjust your glasses so that your vision is perfect from the very start. You may not “need” designer eyewear to be able to see better, but there is no mistaking the fact that you will definitely feel better when you look your best. Make an appointment now using our online reservation link at the top of this page, or call us 818-891-6711 , or come by anytime and see how easily we can find the perfect pair of designer eyeglasses for you.